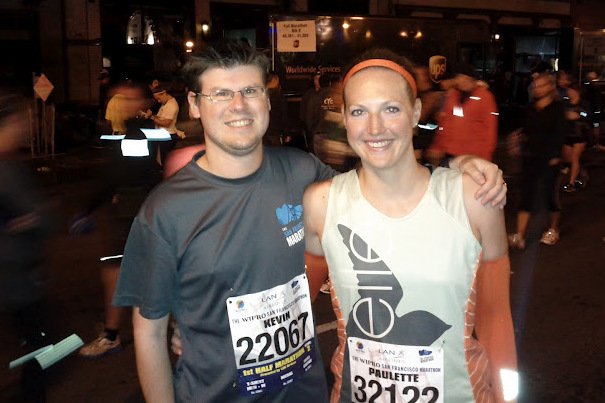 This is one of my favorite recent races because we knew so many other people who were running! I loved meeting a few Tweeps at the race expo and cheering for friends after finishing the 1st half. One of my favorite things about this event is that you can run the 1st half OR the 2nd half, or of course the marathon. I've been feeling a bit off since the marathon on June 23, so I went into this race to enjoy the views and to have fun. I'm super happy about keeping the pace I did on a tough course; I finished in 2:13:36, only a couple of minutes off my PR. The weather was perfect for running, but I admit I was chilly in the mist when we stepped out of the hotel. Luckily, for once I took a sweatshirt and gear check bag to stay warm on the walk to the start line. When we got to the start (Kevin ran the race too) we stashed our gear bag with the UPS truck, took a quick porta-potty break and headed to our start corrals. I started in wave 3 at 5:42 am. One thing I love about the SF start is how they organize corrals; they give each one a start time, so you don't have to be in your corral to wait for 40 mins while the earlier ones start. It didn't matter for me much in wave 3 at 10 minutes behind the start, but it was awesome when I started in wave 7 for the 2009 race. 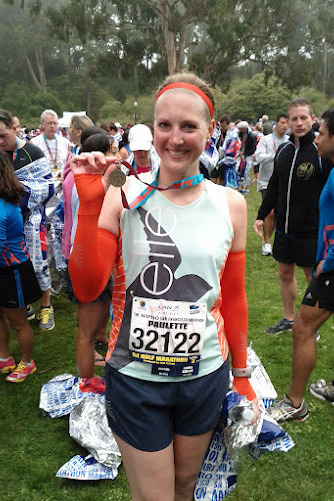 For race outfit, I went with the Oiselle singlet and arm warmers (my new-ish fave) and shorts. I'm glad I did, I was plenty warm in shorts once we started running and never took the arm warmers off. It's very early, and dark. The start was easy and being in wave 3 was way less crowded than when I started toward the back. The corral started a little slower than the pace of the designated 1:50-2:10 half estimate, so mile 1 was slower than I anticipated. Still, I was running on feel for this non-goal race so I'm happy with the early splits. The Fort Mason hill in mile 3 didn't even feel as tough as it used to and the following downhill let me make up the hill climb time. After running through Fort Mason and the marina, one of my fave places to run ever, we started up the hill to the Golden Gate Bridge. I find this hill pretty tough, especially the part after you round the turn and go up again. I slowed down for this in mile 6 but ran the whole thing, then recovered on the bridge. I passed Kevin shortly after getting onto the bridge and had a high five swing & fail in my recovering state. He made fun of me later. I also saw Becka and Heather heading onto the bridge as I was leaving it and cheered hello. Coming off the bridge, the course heads uphill again into the Presidio. This is by far my nemesis hill and I've run it a few times in races. I did better than I ever have this time, and again made up some time on the downhill after it. I did a short walk to get water on this hill; I can run and drink, but I'm not convinced I can run uphill and drink without choking on water. The next mile was a ton of downhill and I ran it well. This is the part of the race where I lost my happy splits and added over a minute to my total time. The hills in the last two miles shouldn't be that bad, not steep just rolling, but they got me. I'd worked hard in the previous miles and my body let me know. When I came over the last gradual incline to see the finish, I ran hard and finished strong. This is the first time I've ever repeated a half marathon course, and in 2009 I ran it in 2:31. It's nice to realize how much better I felt running it this time and to see the progress over the past 3 years. This finish time isn't far of my PR, which is on a much easier course. Kevin had a half PR by about 2 minutes, finishing in 1:48:46. The bling. Big fan of the ribbons with the bridge design. As per usual in my race reports, here are a few thoughts on race organization. The expo. I like the SF expo and feel it is well organized. It was about the same this time as I remember it being in 2009. After entering, you are directed to the pick up section for bibs and then to a different table for shirts. You then go through the merchandise section, although we didn't look around much. The traffic flow continues to the exhibitors, and there are lots of races, companies, and merchandise to check out. 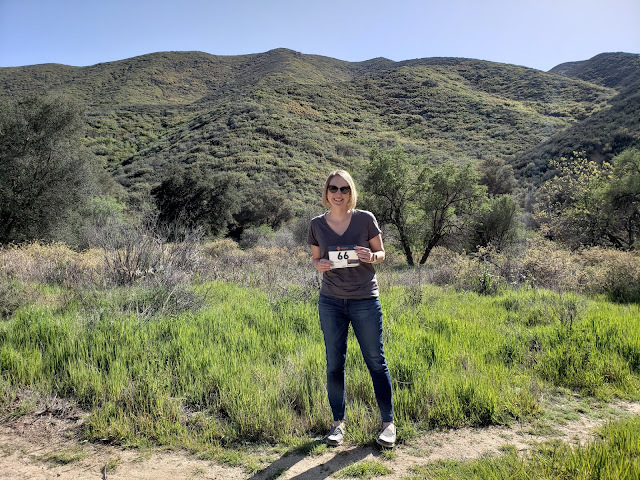 I particularly enjoyed trying on and buying a FlipBelt, testing the Skechers Go Run Ride, and signing up for the Oakland half with a super deal of $45. Side note - I'm still not sure about Skechers making running shoes, but they felt surprisingly good. The race shirts are great, made by Celliant. 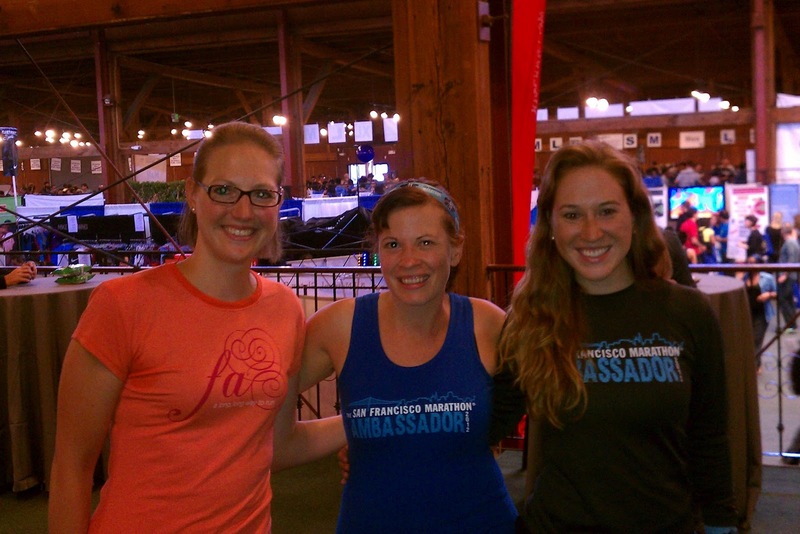 Also at the expo, I went to the Social Media meet up planned by the SF Marathon Ambassadors and met a few new people. I finally met Alisyn, Courtney, and Wes, who I have been chatting with on Twitter for quite some time. The course. SF is one of my favorite places to run, and this course is no exception. You run along the water, on Embarcadero, through the marina, over the Golden Gate Bridge, and into Golden Gate park. Does it get any better? Granted, it's a pretty tough and hilly course, but in my eyes it's worth it. The wave start is very organized, and as I mentioned earlier I like how they give each wave its own start time. It was easy to see the half/marathon split thanks to good signage multiple times. There aren't a ton of spectators on this half course especially at the beginning, but I'm pretty sure it's because of the super early start. The support. Course support was generally good, although I felt like there were fewer aid stations than other races. I didn't need more myself, but I could see where people might like them closer together. They served water and electrolytes at each station and there were Gu gels at the station around mile 7.5 too. Volunteers were doing a good job of keeping cups full and ready to hand out when I went through, making it easy to run by and grab water without getting slowed down. There were many porta-potties and even real restrooms along the course. The finish line had bottled water but no sports drink which I thought was bizarre. Food included Lara bars, oranges and bananas, yogurt, and Panera scones (yum!) They were giving Irish coffee to those over 21, although I opted for regular black coffee instead. We went to the full/2nd half finish line later to cheer for friends, and that one looked a little more lively with Jamba Juice smoothies and beer. After the race, we stuck around to cheer for friends who were running their first half marathon ever and then followed two friends to cheer for them in the second half. I love cheering for races! Celebrating with Paul and Sarah after the 1st half, their first half. More fun with Mike and Natalie after they finished the 2nd half marathon. That's the end - anyone and everyone should check out this race someday! This sounds like a lot of fun...run a half, cheer for others running a half! Congrats on a great finish! Your Oiselle threads are looking great!. Love the orange arm warmers. Thanks! Huge fan of the arm warmers now, definitely a can't live without item. The bib numbers i've seen go over 50,000...sheesh. It's getting crowded! I love your running outfit! Great job on the hilliest half! Great job running those hills! 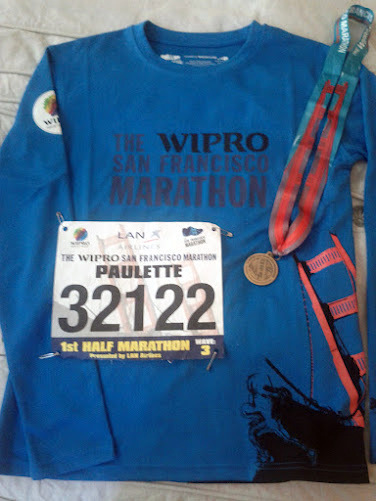 And thanks for cheering for Mike and me...and the awesome SF Marathon sweaty band! great race....and great recap! Nothing quite like going over the bridge....did that a few years ago on a bike tour and it was SPECTACULAR, so I'm sure running over the bridge was amazing. I love running the bridge, I even do it on weekends sometimes! Thanks for the note too. I love the medal ribbon. That is so neat! Congrats on another strong race! What's the deal with the medal? It looks small and colorless from here, but I can imagine there's some tradition or story behind it. Do you know? Great to see you on the course!! I really, really loved this race, and am planning on coming back to do the half challenge ;). Congrats on a fabulous time!! That course is no joke!! Also love the arm sleeves! Oiselle?? Oops, PS, I was also skeptical of the Skechers making running shoes, but my husband, my friend, and her husband, all wear them, and love them. Huh. Good to know! Still not sure I want to try them, but definitely intrigued. Arm sleeves are Oiselle, I've started collecting all the colors. Ha. Congrats on a great race for both of you!